While I doubt that the above is true, there is one thing that can be said for failure: It helps you figure out how to succeed. Admittedly, that’s pretty valuable insight whether you’re a business owner or not. But this is a payments blog for eCommerce merchants selling B2B and B2C, so your immediate concern is probably the possible failure of your global sales efforts. Do you suspect your international sales aren’t as stellar as they could be? If so, your cross-border payment system may be at fault. How do I know if my cross-border payment processing is an epic fail? There’s a high rate of abandonment among international shoppers. Your payment success rate decreases among international shoppers. You’re seeing higher-than-average refunds and chargebacks among international shoppers. You’re not seeing a return on investment for your marketing dollars in a particular country (or countries). If you’ve experienced any or all of the above, it’s likely that your cross-border payment processing system is failing you. That failure might have set your business back up until now, but all that is about to change. 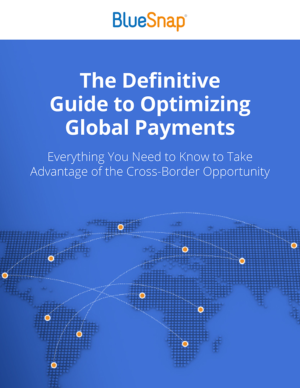 Keep reading for ways you can set your business up for future cross-border payments success. Foreign transactions have a higher likelihood of failure than domestic ones simply because more factors come into play during the purchasing process. Following are the most common reasons why cross-border payments fail for eCommerce merchants, and the fixes that address them. 1. Your checkout page isn’t in their language. Picture this: You’ve gotten numerous word-of-mouth recommendations for a type of video editing software made by a German company. You go to their website ready to buy, but since your German is a bit rusty, you can’t read the checkout page. You could try to navigate it, but how can you be sure you’re not missing out on key product or sales information? Rather than take a risk, you abandon the site—and the purchase. That’s not an unusual scenario. People are prepared to buy from businesses halfway around the world as long as the transaction feels comfortable. If they can’t read the checkout page, that comfort level plummets. In fact, seventy-five percent of shoppers prefer not to make a purchase decision unless the site is presented in their native language! The fix: Use a cross-border payment processing system that automatically detects a shopper’s URL and serves up the payment page in the appropriate language. This tactic shouldn’t require any additional work on your part. BlueSnap’s payment gateway has the capability to display your checkout page in 29 languages—so no shopper is left behind. If you can make this fix, you’ve eliminated an obstacle and increased your chances of getting the sale. Find out more ways you can to maximize global ROI with this free ebook. 2. Your checkout page doesn’t show prices in the shoppers’ local currency. The next obstacle that could arise is a purchase price shown in your currency only—not theirs. Even if international shoppers can read your page, they may hesitate to click the “Buy” button if the purchase price isn’t displayed in their local currency. They’ll have to do the conversion calculations themselves, which adds friction to the checkout process; there may also be unexpected currency conversion fees that “surprise” the shopper, leading to chargebacks or refund requests. Plus, the transaction is less likely to be approved by an acquiring bank if the transaction is not processed in the currency for which the card was issued. The fix: Similar to the foreign language fix above, your cross-border payment processing gateway should be able to automatically read the shopper’s URL and adjust purchase prices to the correct currency. Doing so will dramatically reduce friction in the checkout process and boost your chances that the acquiring bank will approve the transaction. 3. Your checkout process doesn’t support popular global payment methods. There’s no reason shoppers from any country should arrive at your checkout page and not see a familiar payment method. Up to 13% of shoppers will abandon the purchase if they don’t see a local payment option they prefer; or, at the very least, they’ll be less satisfied with the experience. 4. Credit card transactions aren’t processed by a local acquirer. As part of every credit card purchase, customers’ credit card information is passed along with an authorization request to an acquiring bank—an institution that processes credit or debit card payments on your behalf. Most payment gateways partner with a single acquiring bank within their own country—an arrangement that sets international transactions up for failure. Why? Because transactions that are seen as foreign have a higher probability of being flagged for fraud. The fix: Make sure your cross-border payment system utilizes numerous acquiring banks around the globe. A gateway with multiple acquiring bank partners will send your German shopper’s credit card approval request to a bank in Germany, which will see it as a local transaction and approve it. This type of “intelligent” routing to the right acquiring bank increases the payment success rate for cross-border transactions. 5. Your shipping and tax amounts aren’t clearly communicated. If your checkout page doesn’t clearly convey taxes or shipping costs, you could be losing business from international shoppers. Shoppers often abandon purchases if the shipping cost is more than expected; the same is true for taxes. Even worse, some merchants erroneously charge shoppers for taxes they don’t owe. The fix: Clearly communicate your shopping policy and costs at checkout. Consider providing a tool at the beginning of the checkout process so that shoppers can find out if you ship to their country and what the costs will be. When it comes to collecting taxes, companies like Avalara can help you determine how much, if any, taxes should be collected. Shoppers may abandon the purchase if they think they are paying taxes not required in their country or region. Is your business ready to succeed with cross-border payments? At BlueSnap, we’re excited about global eCommerce, so we’re always innovating to improve the international shopping experience. To find out more about how our payment gateway can help you increase sales with better cross-border payment processing, get in touch!